In my business life, “chart analysis” is a common technique employed by many professionals to review the current status of the financial markets – up, down, bear market, bull market, etc. I use these methods to analyze basically everything and today while reviewing some charts of my health, I thought “let’s review my 2016 health situation!” So like the other “series” I have tried to employ on this blog (but do not have time to cover), I will go out on a limb with this one and say that from “time to time” you will see some chart talk on this blog. So what is the point of today’s discussion? Well one question I have had for the last several months is this: with all the miles I have run, how am I not losing weight! 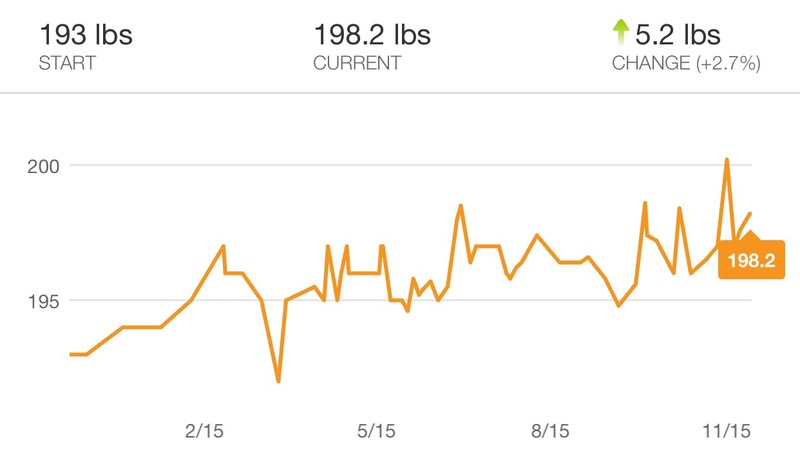 As you can see from the chart below, a year ago I hung out around 193 and today I am ringing the bell 5 to 6 pounds higher. Since December though (and as I posted yesterday in a Monday musings), I have run more miles than a year ago and crossed 1000 earlier this week. Yet, more miles has not translated to lower weight so what gives? What “gave” is the following chart for one. My net calories number this year has been very erratic this year and while I cannot seem to pull the whole years data in chart form, this 90 day chart is good representation for the year as a whole. So to explain above, here is a primer of sorts. 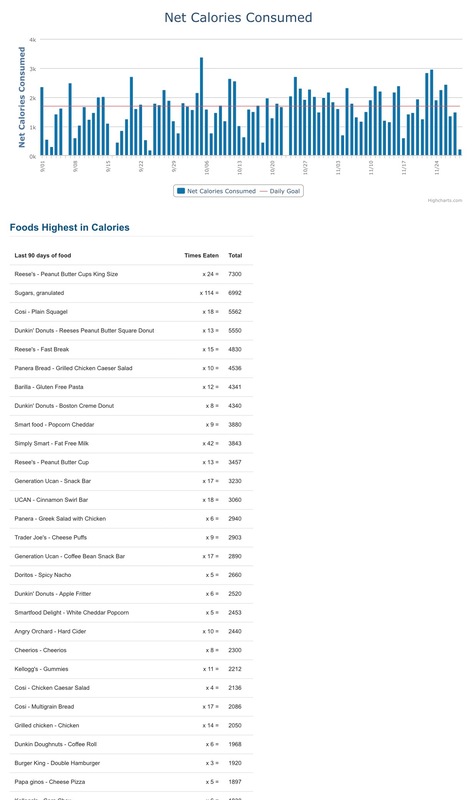 First, net calories are the following: Target Calories per day minus Exercise calories. So if I take in 2100 calories and my running burns off 700 on a given day, my net number is 1400. In theory anything below 1800 will help me lose weight on a constant basis and everything above 2200 calories will lead to a higher probability of weight gain. In looking at the chart above, I have been above the 1800 level consistently and well over the 2200 level many times as well. I am eating so much that an 8 mile run and the caloric burn from such barely covers a few of the meals in a given day! Ok, besides being a huge fan of Reece’s, the problem here for me is sugar. I am taking in way too much sugar and it is causing crashes in my eating (leading to more eating), weak running performance as my energy levels are erratic from run to run and overall poor health (surprising my teeth haven’t fallen out). This is bad! 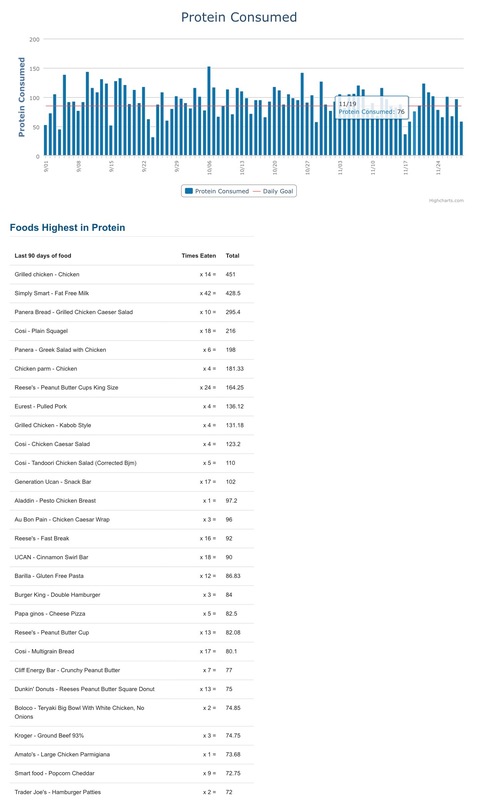 Another reason that my weight has been on the rise is my level of protein intake. Here is my 90 day look back. This chart is much like the sugar chart except I am constantly under the target which is a negative! So I am consuming too much sugar and not enough protein…a very bad mix. Without the running this year, I could be 10lbs higher than my current weight! Need to cut out the Reese’s and add more carrots! Well, hope you enjoyed my first Chart Talk. Thank you for reading as always! Previous Post Monday Musings…1000 miles! Next Post Being Carried Away by the Broomstick!